SK Telecom announced today that it will partner with the largest U.S. education company, Houghton Mifflin Harcourt (HMH), which provides educational content to 120 countries across the world, to strengthen domestic smart learning business and kick off global smart learning business. The two companies signed an agreement on May 31 at SK Telecom’s headquarters in Seoul with the attendance of Bae Joon-Dong, President of Network Operations Business of SK Telecom, and Timothy Cannon, Executive Vice President, Strategy and Alliances of HMH. In addition, Mark Tokola, Deputy Chief of Mission, the Embassy of the United States Seoul Korea, attended the signing ceremony to congratulate and recognize the significance of the alliance between the two leading companies in the education and telecommunications sectors in Korea and the United States. Through the partnership, the two companies will converge their core capabilities in information communications technology (ICT) and educational content to (1) cooperate in the education content platform business, (2) jointly develop an education platform targeted at the global market, and (3) conduct a range of globally oriented smart education businesses in Korea and overseas markets. Through the alliance, HMH will develop and provide more than one thousand contents, including Destination and Leveled Reader, while SK Telecom will collaborate by developing viewers, apps, billing systems, certification systems, synchronization functions and other platform functions. 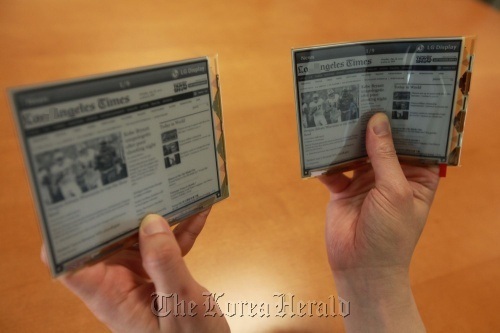 LG Display’s mass produced plastic e-paper could boost the global e-book market. On Thursday, LG Display said it began mass production of a plastic e-paper that is half the weight and one-third the thickness of existing glass-based displays. This makes it possible for more portable e-books, as it can be bent up to 40 degrees. The displays also do not break easily, and can be safely dropped from 1.5 meters, according to LG Display officials. Maintaining a thickness of 0.7 millimeters and a weight of 14 grams, the company was the first in the world to commercially produce 6-inch plastic e-paper. With plans to launch it in the European market by early next month, the plastic displays are energy-efficient and can withstand high temperatures. South Korea’s market for online or electronic-learning (e-learning) systems rose sharply last year with more than half of the population aged over three saying they have used such educational aids, the government said Tuesday. Combined sales by the country’s service operators rose 9.2 percent from a year earlier to about 2.45 trillion won ($2.19 billion) in 2011, according to the Ministry of Knowledge Economy. The number of service providers also increased 6.9 percent on-year to 1,656 with the number of people hired by these companies rising 7.3 percent to 25,182.